We are kindly advice you that some of our facilities and outdoor activities of our hotel might be Not available at the very early or end of season. This is subject of weather & availability of the hotel. 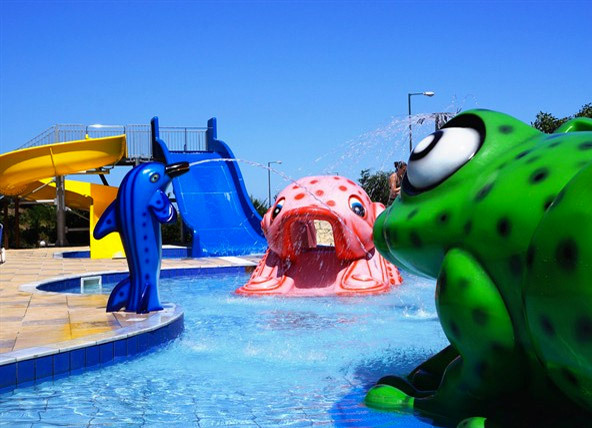 Two waterslides for adults and a small new pool with water games for children. Book now and get 15 min free massage treatment for every adult. We welcome you to step into the world of our wellness center. MEDITERRANEO HOTEL is a wheel chair friendly hotel, with easy access through elevators or ramps in all basic hotel facilities and services including reception desk, restaurant, lobby bar, main pools, gym-fitness room, spa, souvenir shop, conference center and more. There are 2 main buildings which can accommodate guests on wheel chair, with rooms with wide doors and walk in shower. We kindly ask for an information in advance, in order to reserve a wheel chair friendly room. Please note: MEDITERRANEO HOTEL is located on an elevated position and 400m. away from the beach. L. Hersonissos, Crete, 700 14, Greece.